we can solve by ourselves." of them is good. Your timing was perfect, as a matter of fact. The activity here reflects the sort of positive energy which oozed endlessly from the APUSH crew of 2012-13. It also mildly supports one of the instructor's base themes regarding responsible study of historydo not think of history as just a bunch of seemingly disconnected photographs politely placed in an album with meaningless gap between them, but rather as an ongoing and often messy collage of overlapping events which perpetually impact one another. This is a competition. If you want to be part of all the fun and excitement, simply create a team with one or two fellow APUSHers. The objective is to identify the historically significant source of each letter (some are paired) used in the APUSH Website title montage. Be precise! The first group to successfully complete this activity will be aptly rewarded with a special prize package certain to thrill every member of the winning team. See the instructor for more detailed rules. You can click here to obtain an official contest entry form. The first set of clues will be posted when school opens in August. Good luck! The 2012-13 group recognized my high regard for Lyndon B. Johnson as President, whom I described, paradoxically but affectionately, in lecture as �a Texas-sized SOB with a ten-gallon heart.� There were few national domestic programs in United States history extensive as the Great Society, and few major foreign policy behaviors more poisoness than America's involvement in the Vietnam conflict. Both ventures have the "LBJ" brand all over them. Without the Great Society, LBJ�s presidency would be regarded as not much better than average. On the other hand, eliminate the Vietnam fiasco and historians today might very well include LBJ, when evaluating past Chief Executives, with the likes of Thomas Jefferson and Andrew Jackson and Theodore Roosevelt, occupying the tier of presidential greatness just shy of that attained by George Washington, Abraham Lincoln, and Franklin D. Roosevelt. The polar anomaly of Johnson's White House legacy seems to foster a peculiar legendaryesque status for him among Presidents. 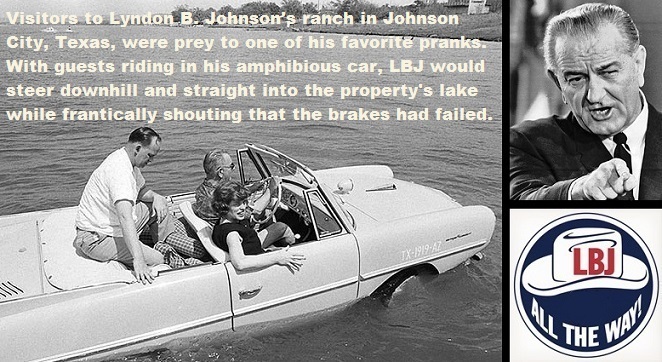 No doubt there was plenty about LBJ to not like, but there was so much more about him to appreciate. Designed and manufactured in Germany, the Amphicar was sold in the United States during the 1960s. Besides being amphibious, the vehicle was unique because direction was determined by its front wheels, which jointly served as the steering apparatus on land and the rudder in water. Twin propellers mounted directly beneath the rear bumper provided water propulsion. The car's performance was not flawless, but nevertheless reliable. One owner quipped, "We think of it as the fastest car on the water and the fastest boat on the road." (Indeed, maximum speeds were quite modest70 mph and 7 knots.) Another skeptic described the Amphicar as "a vehicle that promised to revolutionize drowning."